Your author has been a corporate and economic researcher for almost twenty-five years. During that time, we have encountered MANY crazy statistics. Most of them can be thrown out in ten seconds or less as obviously flawed, generated by suspect sources or both. But once in a while, even a crazy statistic can have merit because it comes from an unimpeachable source. This is one of those times. According to the State Department of Assessments and Taxation (SDAT), there were nineteen new business filings in MoCo in Fiscal Year 2016. Not nineteen thousand or nineteen hundred. Nineteen. This stat came to light in connection with HB380, a bill introduced by Delegate Mark Fisher (R-Calvert) that would exempt new businesses from paying personal property taxes. In writing the fiscal note for the bill, the General Assembly’s Department of Legislative Services (DLS) had to estimate how many new businesses are started around the state and the volume of personal property taxes they pay. So DLS went to SDAT, which processes business filings as part of its duties. All corporations and partnerships must register with SDAT to operate legally in the state. SDAT reported to DLS that the state had 332 new business filings in FY16, of which nineteen were in MoCo. SDAT’s tabulation of new business filings by county in FY16. Could this be a fluke? That’s a natural question to ask of any seemingly crazy stat. Fisher introduced a similar bill two years ago (HB572) for which a fiscal note was drafted using FY15 data. 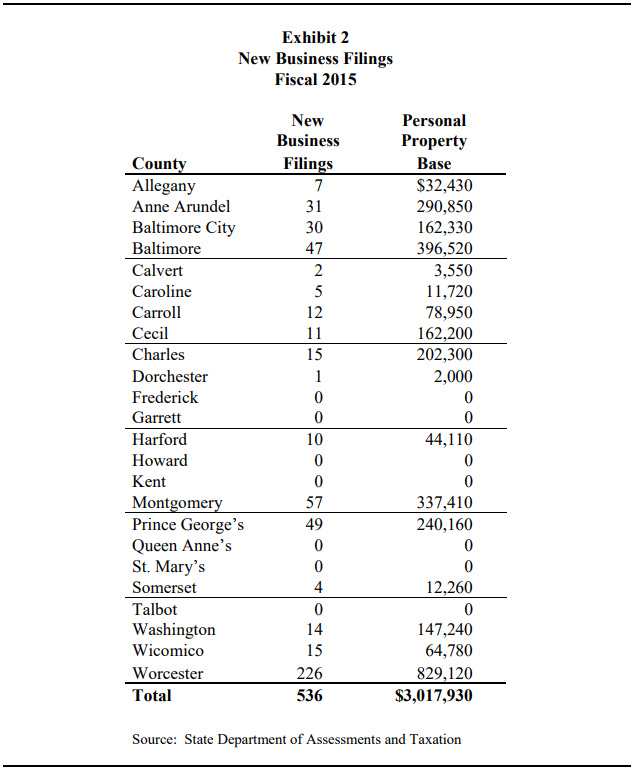 In that year, the state had 536 new business filings, of which fifty-seven were in MoCo. SDAT’s tabulation of new business filings by county in FY15. Let’s note that this data does not directly address jobs, the huge majority of which are created by existing businesses that expand operations. But MoCo has been a weak job generator over the last fifteen years and in order to have existing businesses, new ones must be constantly created. An anemic pace of business formation may eventually impact job creation. According to the Census Bureau’s 2012 Survey of Business Owners (available through American Fact Finder), there were 118,965 firms in Montgomery County, 21,396 of which had paid employees. Given those numbers, one might expect hundreds of firms to start up and a similar number to go dark every year due to the churn of capitalism. But nineteen new companies in one year? Bethesda Magazine printed a list of sixteen Bethesda-area restaurants that closed in 2016. If only a handful of more businesses closed in the entire county, MoCo would have had net negative business formation that year. Additionally, MoCo’s performance relative to the rest of the state was sub-par. According to the Census Bureau, the State of Maryland had 531,953 firms in 2012, of which 101,876 had paid employees. So MoCo had 22% of all firms in the state and 21% of the firms with paid employees. 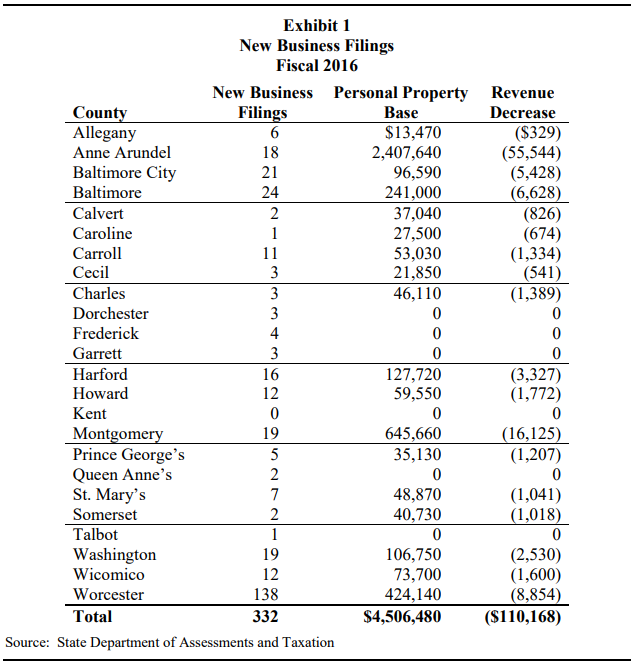 However, MoCo had just 6% of the state’s new business filings in 2016 and 11% of new filings in 2015. We would love to acquire historical data to see if this is a trend. This data joins soft recent growth in employment and income as well as the $120 million budget shortfall, half of which was due to factors other than tax planning by the wealthy, as evidence that our economy is not as strong as we would like it to be to pay our county’s bills. And because the new business filings were weak in many other local jurisdictions besides MoCo, economic growth must draw attention across the state as well. Which candidates for office do you think can help turn this around? The SDAT data used in Exhibit 1 in the Fiscal and Policy note is for new business filings for those businesses with assessed personal property for that year. The fiscal note could have been worded a bit more specifically to mitigate any confusion, however, the bill would have provided a personal property exemption for businesses with personal property, so businesses with no personal property would not have had an impact on local revenues. We never asked for all business filings as the bill really only dealt with a personal property tax exemption.